Your user name/password combination is not valid. The Certificate/Award in Practical Languages continues to be the most successful alternative language qualification to the GCSE. It is frequently offered at level 1 in year 9 and level 2 at KS4. This language pathway closely mirrors the practical application of languages to the workplace. It has proved to switch on the most disaffected learner, increase uptake at KS4 and substantially raise attainment. Our partner ILanguages offer a full package including a scheme of work, lesson plans, assessments and all the activities you would need including ICT resources to deliver it in either French, German or Spanish. For those Schools that require assessment our fee is £25 per candidate. Please note that there are additional charges per candidate for certificate reprints; for requests more than 3 months after the certification date. The Award/CertificateL is an assessment-based, flexible and personalised pathway with a business context. It has proved to make language learning far more accessible, achievable and motivating to a higher number of pupils, especially boys. It enables MFL departments to improve results and if offered in Year 9, can increase uptake significantly at key stage 4. What is it? A practical qualification developed by industry to meet the needs of the modern workpace. How is the qualification gained? There is no exam so students build up a portfolio of assessments over the duration of their course. How are pupils assessed? Each language skill is assessed separately i.e. in speakin & writing, reading & understanding the spoken word (listening). What criteria is used in the assesssments? The language units are based on the National Language Standards - a scale of competence which sets out the knowledge and skills needed to perform competently in another language in a business setting. When do students do the assessments? When the teacher (assessor) decides they are reading to take an assessment. There is no exam window. Are there any materials available for teaching the course? Yes, we have a scheme of work available which includes lesson plans, assessments, worksheets, powerpoints and interactive whiteboard activities – infact everything you would need! How many assessments are there? It depends which scheme you use. The ilanguages scheme contains 3 assessments per skill at level 1 and 14 at level 2. Do students have to do all the language skills to achieve the Award / Certificate? No, it is designed to be flexible. Students can do any number of skills, for example a student could achieve a level 1 Award in speaking. How many levels are there? We offer three levels,however, schools tend to deliver one and two. A few schools deliver level 3 in year 12. 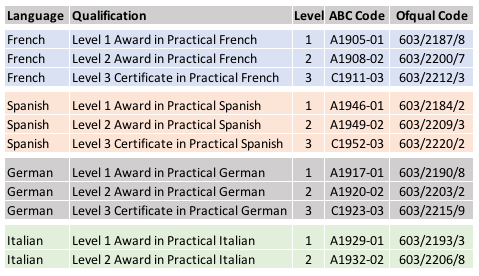 Can the languages award or certificate be used for the Additional Specialist Learning part of a Diploma? A level 1 Diploma needs 120 hours of Guided Learning Hours. A level 2 Diploma needs 180 hours. The Guided Learning Hours value for a level 1 Award is 79 hours and a level 2 has a GLH value of 98. Therefore the Award or Certificate could be used as part of the ASL but you would need to add something to it to make up the required number of hours. What qualification does a student gain? 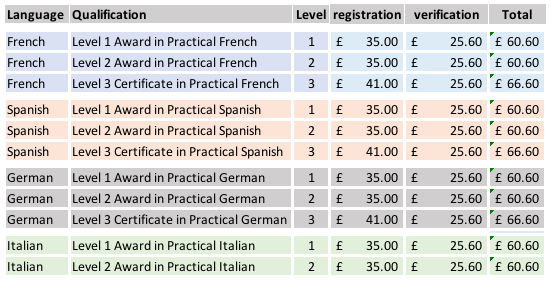 A student will gain an ‘Award’ in the language at level 1 and a ‘Certificate’ at level 2 and 3. Level 4 is known as a ‘Diploma’. How achievable is it? It is designed to be achievable. As there is no exam, pupils learn in bite sized chunks and then do regular assessments. This makes the learning far more manageable than cramming two years of learning into one exam. What happens if a student doesn’t achieve an assessment? After each assessment, the assessor (teacher) gives constructive and supportive feedback. This is a crucial stage in the process. A student who does not achieve an assessment first time round can revisit it more than once. Are the assessments difficult? Level one is very straightforward, level two does increase in level of difficulty. However, students are allowed to use reference materials such as their notes, vocabularly lists and dictionaries during assessments. In fact, referencing is one of the skills assessed in NVQ. But using reference materials in an assessment is cheating! Not at all! It is designed to simulate the business world. In real life, a person in the workplace would not be operating in an exam like environment and would use whatever support was required to do a language related task whether it was translating a fax or listening to a voicemail from overseas. from scratch in year 10, focusing on level 1 materials as foundation for a term and then start level 2 and the assessments in the second term. How do I register my candidates? Students need to be registered through approved centres which will provide you with guidance and support. Ten weeks before the claim for it needs to be made. Your centre will inform you of the date for registration. When do students need to be entered? A school would need to follow the application procedure of one of the awarding bodies. A new and innovative Ofqual approved qualification. If you would like to learn more please register for one of our training webinars via the link below, access details will then be emailed to you a day or two before. Your Browser do not support IFrames. Your Browser do not support IFrames.